In the compound of our sisters’ convent in Namuntuntu, at the western part of Kavango Region, stands a hut where the late Archbishop used to spend his holidays from 1987 until his death in June 2002. The faithful of the Vicariate of Rundu have long been asking for a memorial place of the late Archbishop Haushiku, the first Namibian Archbishop of the Archdiocese of Windhoek, Namibia. 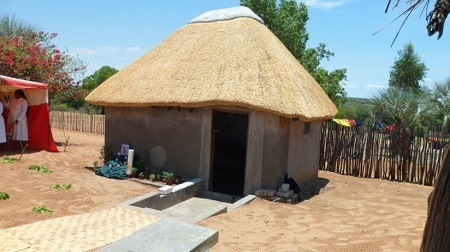 Having asked the permission of Archbishop Liborius Nashenda, OMI of the Archdiocese of Windhoek, and Bishop Joseph Shikongo, OMI of the Vicariate of Rundu, the Missionary Benedictine Sisters of Windhoek Priory undertook the necessary repairs of this hut which would be the Memorial Hut of the late Archbishop.